A new species of tiny crocodile that lived 126 million years ago has been discovered, from fossils found on the Isle Of Wight. Experts says two fragments of a tiny crocodile skull, found three months apart by different private collectors, not only fit together perfectly to make a complete skull they also reveal a remarkable new species of ancient crocodile. 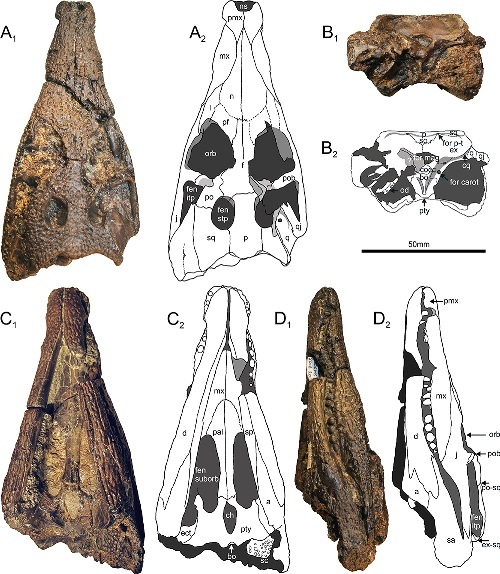 The species has been named Koumpiodontosuchus aprosdokiti, which means the ‘unexpected button toothed crocodile’, by University of Portsmouth palaeontologist Dr Steve Sweetman, who has published a paper on the discovery in the journal Acta Palaeontologica Polonica. The back half of the tiny skull was found on a beach near Sandown on the Isle of Wight by Diane Trevarthen, while on a fossil-hunting holiday with her family. She took the discovery straight to museum, Dinosaur Isle, and showed it to staff who thought it might be part of a skull belonging to a baby of one of the island’s well known large Cretaceous crocodiles. Three months later Austin and Finley Nathan, also fossil-hunting while holidaying on the island, found another tiny fragment of skull, this time a snout. They too took their find to Dinosaur Isle to show it to staff who immediately recalled they had seen the back part of a similarly small skull a few months before. The museum asked Ms Trevarthen to return her specimen so they could re-examine it and were delighted to find that it fitted perfectly together with the snout. Both collectors generously donated their specimens to the museum allowing scientific study of the complete skull. “Both parts of this wonderful little skull are in good condition, which is most unusual when you consider that crashing waves usually batter and blunt the edges of fossils like this within days or even hours of them being washed onto the beach. Both parts must therefore have been found very soon after they were released from the mud and debris originally laid down on a dinosaur trampled river floodplain around 126 million years ago. However, closer examination soon revealed significant differences in the arrangement of bones suggesting that the Isle of Wight skull may at least represent a new species. Dinosaur Isle’s Gary Blackwell prepared the lower part of the skull to free it of mineral encrustations. His work revealed the bones of the palate and the inner opening of the airway from the nose. “The position of this was most unexpected,” said Dr Sweetman.